Rose gold accessories and watches continue to be one of the most popular shades for men and women, and if there's one brand that has helped to push rose gold watches to the forefront of fashion, it's Michael Kors. Rose gold watches are available in all sorts of shades and styles, perfect for a special occasion or as a piece of everyday wear. Michael Kors rose gold watches are no exception, and with men's and women's styles available, you can find an ultra-trendy piece that suits your personality. 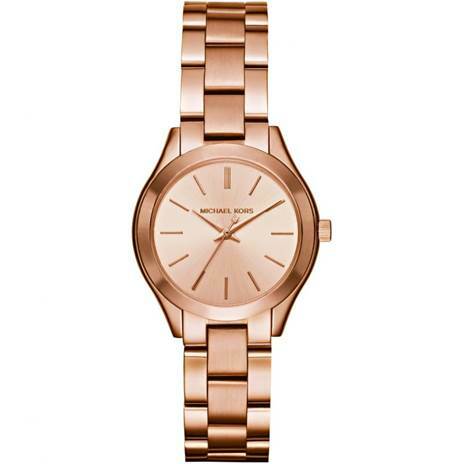 Explore some of our favourite Michael Kors rose gold watches and get inspired to add a touch of pink to your wardrobe. 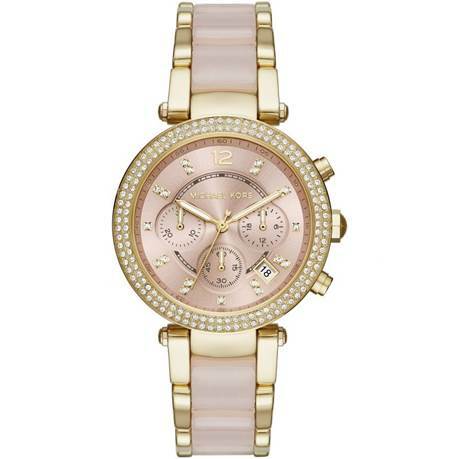 Wear your love for Michael Kors loud and proud on your wrist with the beautiful ladies' Michael Kors Parker watch. The design is centralised around the iconic MK logo, with a large dial for easy timekeeping and bold styling. The entire watch is coloured rose gold, using different textures and shades to add depth and ensure the logo stands out. Framed with flattering gems, it's an ideal rose gold watch for fashionistas, perfect for a night on the town. At the opposite end of the style spectrum is the ladies' Michael Kors Mini Slim Runway watch, a subtle, slim watch that's designed for daily wear. Simple and understated, the classic Michael Kors styling gives this timepiece a special edge. Rose gold brushed metal adds complexity to the face, which is finished with simple line time markers. The glossy metal bracelet glams up an everyday outfit, adding edge to workwear and making you feel polished and sophisticated. Rose gold watches aren't limited to ladies designs, and as the men's Michael Kors Lexington watch proves, rose gold can be used to create a masculine timepiece. The face employs the classic chronograph layout, which also adds depth and tone to the colouring of the watch. A thick, black leather strap finishes the look, creating a strong accessory that looks dapper with a well fitted suit for a wedding or networking event. Michael Kors is known for creating extremely glamourous and feminine accessories, and the ladies' Michael Kors Parker Chronograph watch is no exception to that rule. Showing that the brand's designers know exactly what a girl wants, this watch focuses on the 'rose' in rose gold, for an ultra-glam look. This special occasion watch features chronograph timekeeping, so it's far more than just a pretty face, as the multi-function capabilities can keep up with your busy lifestyle. The yellow gold accents and use of gems make this watch irresistibly feminine, which is ideal for women who like to look their best. 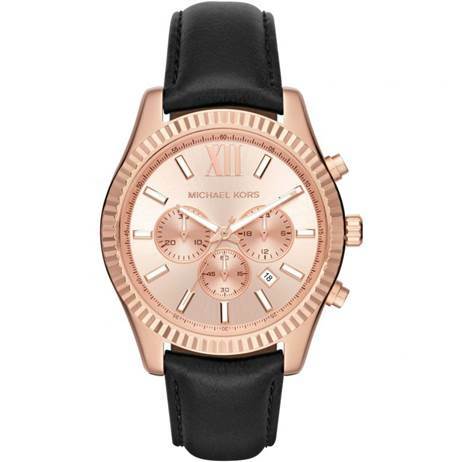 Michael Kors rose gold watches for ladies and men are the perfect choice for a fashion forward look. 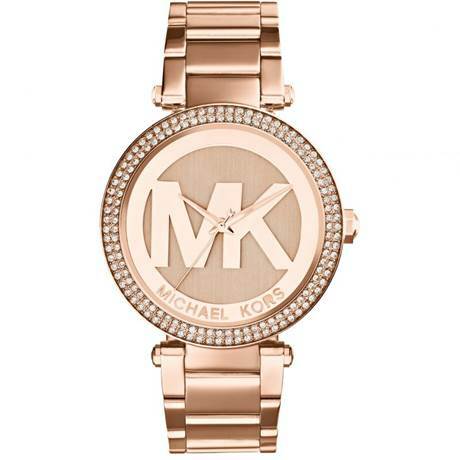 Browse all Michael Kors watches to find your perfect piece, in rose gold, yellow gold, or silver, to suit your style.